This recipe is to go with my previous entry ~ Curried Beef Puffs ~ but you can have this dip with pretty much anything, even as a chip dip. I like having something with a yoghurt base when I have anything spicy to eat because it counter acts the heat from the dish. Having a sweet, refreshing mango lassi along side a full Indian banquet is always a win. Making this dip is fuss free, and everything goes into the one blender / food processor. Spice it up or mellow it down, it’s all up to you. I don’t like overly tart yoghurt so I usually add about half a teaspoon of sugar to take the egde off. Add some lime zest or a pinch of cayenne pepper, go ahead and experiment with flavours. 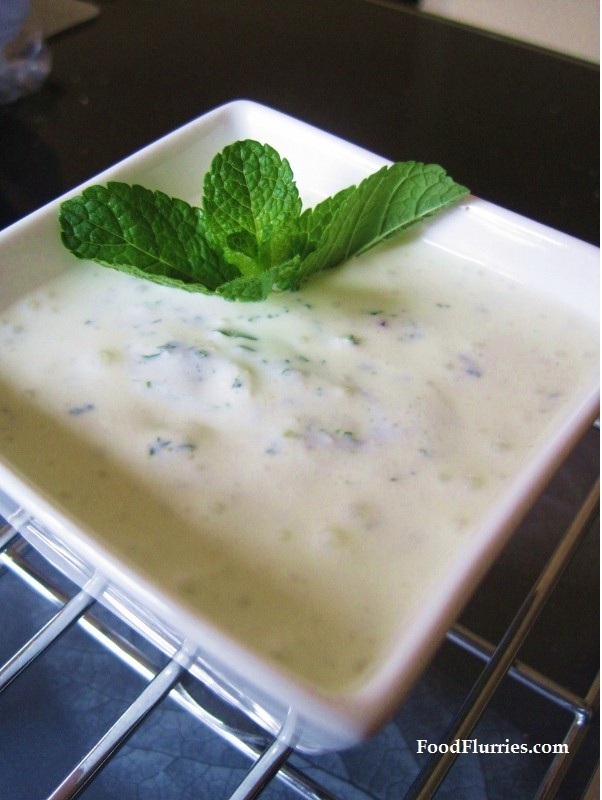 I personally despise those watered down mint chutneys some Indian restaurants give you with your Chicken Tikka, so I like to use a firmer, more set Greek-style yoghurt for this recipe. So here is my version I did today. Toss everything into the blender and VOILA!! Super easy yet super yum. Give it a try today.